sawai madhopur is originally called Madhopur is a significant and beautiful district of Rajasthan is full of histories and legends. It has bore testimony to many battles fought and seen the rise and fall of many battle scenes. There are architectural ruins of many temples and monuments, beautiful ponds and lakes, forts and temples. The main tourist attractions in sawai madhopur are the famous Ganesha Temple, the Chamatkar temple, the Ranthambore Fort and the Khandar Fort. The places around sawai madhopur are also thick with historical ruins. sawai madhopur have the famous national park of Ranthambore. This Park has a rich population of wild birds and animals including Indian tiger, which are the main tourist attractions in sawai madhopur. Apart from the tiger and various wild lives, there is an old fort, which also feature among the tourist attractions in Ranthambore. sawai madhopur, which houses the national park on its edge, sports a perfect blend of rugged nature and history. 300 varieties of trees, 50 aquatic plants, 12 species of reptiles such as Marsh Crocodile and amphibians , 272 types of birds and mammals of 30 species inhabit in the rough wilderness of Ranthambore National Park. 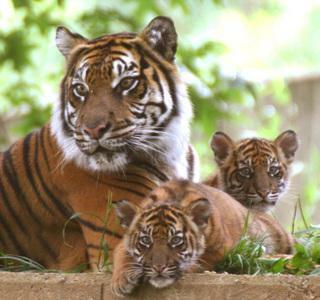 From 1973, Project Tiger has been launched here in a bid to increase the population of tigers. The landscape, which is located on the junction of the hill, ranges of the Vindhyas and the Aravalis offers ample scope for watching tigers along with other animals. Apart from tigers, you may also come across Leopard, Jungle Cat, Hyena, Fox, Jackal, Sloth Bear, Wild Boar, Blue Bull (Nilgai) and a variety of Deer. On the backdrop of the mountains, the 1000-year-old fort inspires sheer awe in the onlookers’ mind. The complex of the Ranthambore Fort has a glorious past and houses summer palaces, cenotaphs, tombs and bauris or stepped-wells. Impressive fort is undoubtedly worth a visit.